Thanks so much, Jodi! :)) I hope you have a great weekend. Thanks, Kerfe. Gotta love those neos! 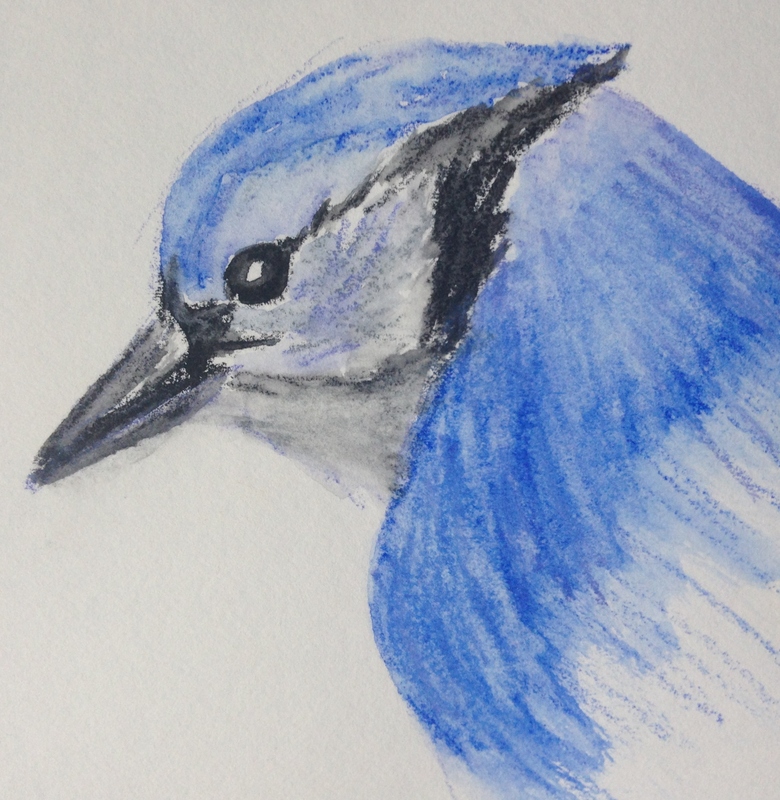 My Blue Jays send along their praise for the wonderful way you portrayed them. They seem to think they are indeed worthy subjects! Thank you, Tori. I’m determined to. So glad you enjoyed this!! Lovely blue jay, Laura! ❤ He looks like he's about to leap out and steal my piece of toast. 😀 I hope to make time to play with my Neocolors today! Thank you Laura, I’ll give it a go! Blue is my favorite! This is lovely. Thanks, Catherine. I’m partial to the blue birds too! And red. Especially in the snow. He’s clearly a very rock ‘n’ roll Blue Jay… Gorgeous! He’s a hopper and a bopper! Thanks Iris! Wonderful blue jay Laura! Have a great weekend. Thanks so much, Mary. And you, my friend! Lovely blues, Laura! And a suitable look of determination in his eye. My cat sat right up and looked at your drawing, so I think it gets his seal of approval too! LOL thank you, Jacob! I appreciate your words of encouragement, and but doubly happy your cat also took notice! 😀 meows and purrs to you! Ahhh, beautiful Jay! Keep them coming Laura! Thanks so much, Cathe! Another one is posting in about ten minutes….definitely a more abstract feel to that one. So glad you enjoyed this! Love this guy! You make art look so effortless. Great! Carol, with those Neos…..it really is. I know it sounds crazy. But it’s true! Thank you. Please please please? Yes. Thank you. I should be a salesperson for them lol! Yes. Wonderment in a stick! Hey Mr. Blue Jay!! This is beautiful Laura! Like the close up! Thanks, Jennnifer! It was a lovely photo Kathy posted that gave me a big leg up!